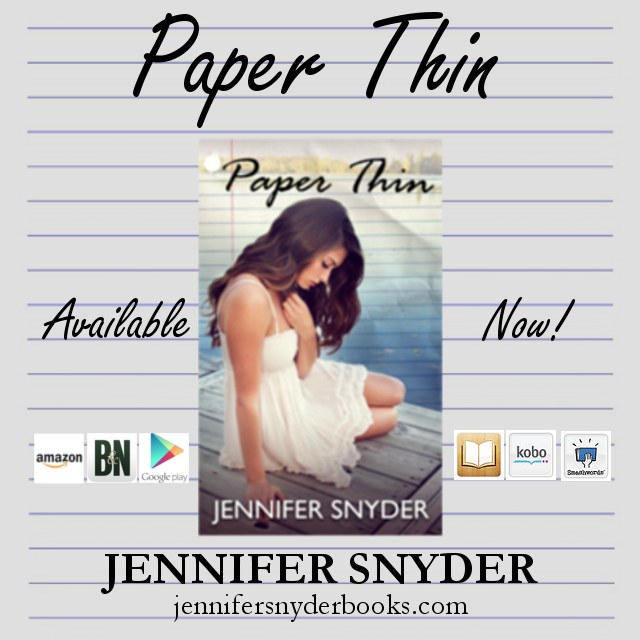 Good Choice Reading: Release Blitz & Giveaway: Paper Thin by Jennifer Snyder! Release Blitz & Giveaway: Paper Thin by Jennifer Snyder! Fate has always seemed to mock Charlotte Montgomery, continuously dangling the man of her dreams just out of reach. It isn’t until Charlotte receives word her older sister Emma is getting engaged that she feels fate’s teasing has hit a new high. Once she begrudgingly decides to return home to the tiny town of Parish Cove, curious to find out who has captured her sister’s heart, fate suddenly seems as though it may have tossed her a bone. The problem: Charlotte forgot one simple thing…Fate has never been her friend. Emotions run high. Happiness will be shattered. And tragedy will strike, leaving everyone feeling paper thin. I closed my eyes, sealing off myself from the thoughts of my conscience, and waited for the feel of his lips pressed against mine. I wondered if they would steal the breath from my lungs like they had when I was fifteen. I wondered if his kiss would cripple me with lust the way I always imagined. My heart thundered with anticipation inside my chest even though I knew this moment was wrong.